25.03.2018 (Hvino News). 32 Georgian wine companies have participated in the 98th China Food & Drinks Fair in Chengdu (CFDF), Sichuan Province, China, on March 22-24. The following wine companies participated: Telavi Wine Cellar, Giuaani, Kakhuri, Vite Vera (Besini), Vinagora, Kakhetian Wine Cellar, Askaneli Brothers, BG Wines, Chelti, Tbilvino, Palavani, Kotekhi, Wine Man, Kimerioni, Shilda, Satavado, Teliani Valley, Jimsher, Corporation Georgian Wine, Bolero and Co, Chateau Mukhrani, Winery Khareba, GWS, Batono, KTW, Maranuli, Georgian Wine House, Mosmieri, Corporation Kindzmarauli, Schuchmann Wines, Vaziani Company, Dugladze Wines and Spirits. "Georgian wine companies have already participated in the exhibition for the fourth time and it is noteworthy that the number of participant companies is increasing annually. 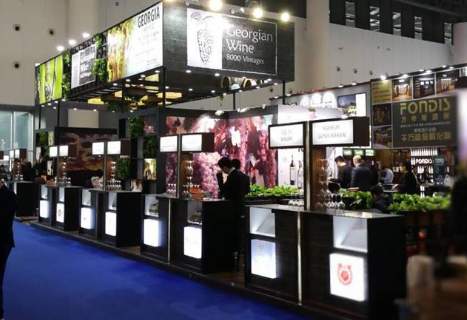 This year's exhibition was quite productive for Georgian wine producer companies. Some of them have already signed new agreements during the exhibition and some has started negotiations with potential importers, which is the main task of Georgian companies participating in this exhibition, " - said Tamta Kvelaidze from Georgia's National Wine Agency. CFDF is held since 1955 and regarded as the number one exhibition in China. CFDF is held every spring in Chengdu, and in the autumn in another selected city. As a leading Chinese trade fair in the wine industry, it had approximately 3,000 exhibitors and 300,000 buyers.